July 30 Short Range T Update. 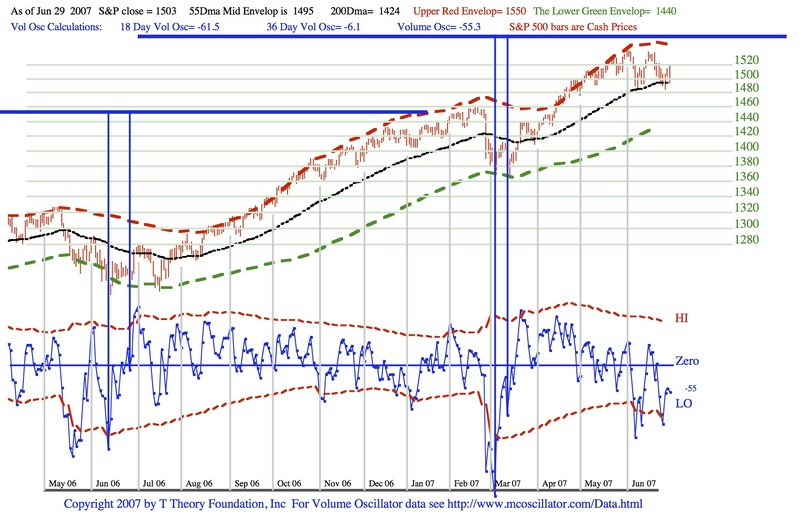 Use the link below to view the PDF image of the current blue volume oscillator and the S&P bars as the relate to my key three envelope reversal lines; the upper red dashed line currently at S&P 1561,the black dotted 55 day MA at 1509 and the lower green dashed line at 1456. A bottom should be forming this week. 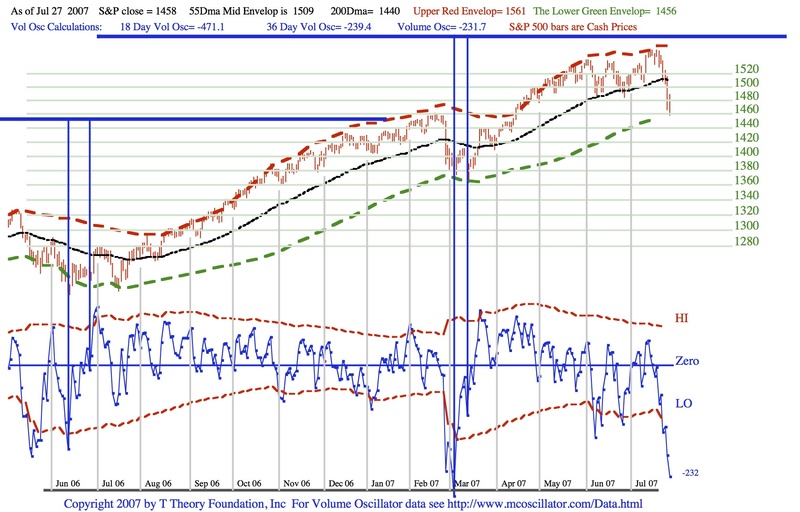 When the volume oscillator failed to sustain the rising bottoms pattern previously generated as the S&P found a double bottom on the black 55 day MA then the possibility existed that a drop to the green bound at S&P 1456 would occur. This conclusion comes from what I called envelope theory which summarizes history as having a trend that can only jump from one of the three envelope lines to one of the other two. This is only approximately true for the exact levels noted in the chart, however it is universally true as a way to think of new trends because the option is only for two new outcomes, which you will eventually figure out with experience and help from other indicators. 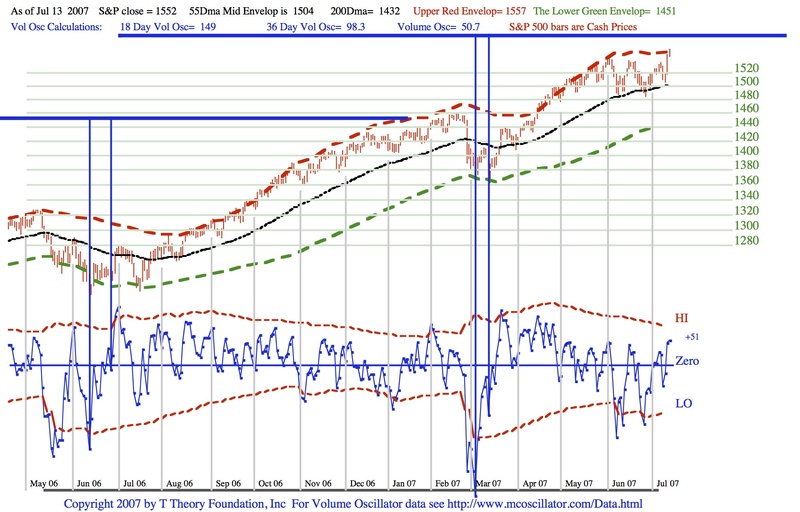 This same pair of options exist once the bottom at the projected 1456-ish green line is confirmed by a rising bottoms pattern in the blue volume oscillator. 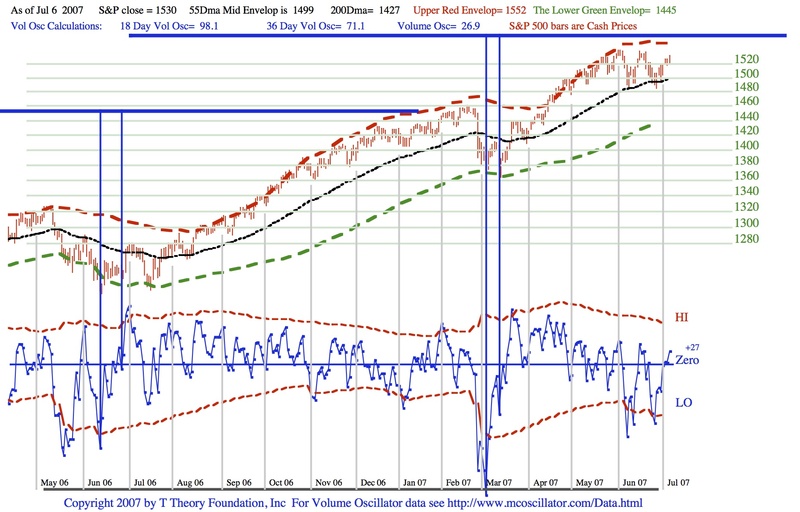 Note that of Friday the oscillator is extremely low and a selling climax has probably occurred. More time is needed to confirm a typical rising bottom pattern which suggests the development of a bottom formation at the green line but for now let us assume it will develop within a week or week and a half as is normal of past oversold conditions. Once the S&P bottom looks to have over-stayed its oversold position on the green level then it is clear that the next move must be up. Assuming there are on three stable known S&P levels approximated by my chart calculations, and the lower one is about to be exited, we can see the two remaining options 1509 and 1561 are both above so the opportunity presented is for buying or holding. Of course the question we all want to answer is whether the eventual outcome a month or two hence is only to the 55 day MA or more optimistically to the full bullish higher level state come Fall. The answer is that we can only move one step at a time patiently awaiting the outcome of each step before trying to jump over two steps. The next week’s task is just to verify a bottom pattern can be seen in the volume oscillator,then focus on the quality of the assumed rally to the 55 day MA. July 23 Short Range T Update. Use the link below to view the PDF image of the current Short Range T’s progress to its projected late Fall market peak. The S&P has backed off probably due to Dow 14,000 jitters, but there is no reason for a more serious pullback to the 55 day Moving Average. It will be bullish for a breakout to the upside if the blue Volume Oscillator sustains its rising bottoms pattern by firming on Monday so as to indicate good buying power exists on the pullbacks. July 16 Short Range T Update. Use the link below to view the PDF image of the current Short Range T satisfactory progress to its projected late Fall market peak. The recovery is progressing normally according to the current Short Range T. See the PDF link below for the updated chart. 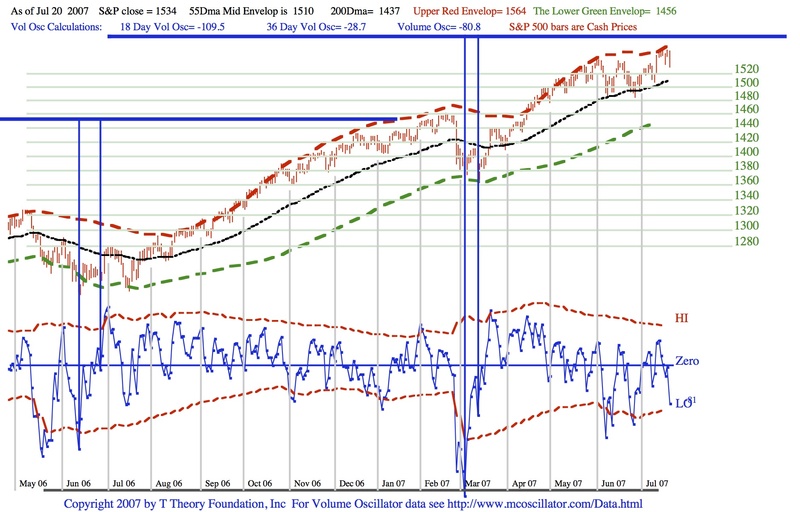 As to the coming week, we need to see the current basing at the 55 day exponential Moving Average hold corrections and that the rising oscillator bottoms pattern continues to set the stage for the projected advance. My Envelope Theory provides the Bull vs Bear alternatives. In a Bull environment the basing will set the stage for a new advance that will carry to the upper envelope (Red) before the S&P becomes overbought. In a Bear environment the basing will fail and a new decline phase will carry the S&P to the lower envelope (Green) before the S&P becomes oversold. The outcome will be apparent quite soon. This entry was posted on April 17, 2013 at 12:34 PM and is filed under . . . T Theory®. You can subscribe via RSS 2.0 feed to this post's comments. You can comment below, or link to this permanent URL from your own site.